Heinrich Himmler created the SS in the 1930s as an ideological elite military force. SS- Verfügungstruppe (Special Disposal Troop, or SS-VT) units took part in the invasion of Poland in September 1939, and in the following month the decision was made to quickly expand the force into what became known as the Waffen-SS. Unfortunately, due to sales rights restrictions, we cannot offer 6533: Into The Cauldron for sale in your country. Heinrich Himmler created the SS in the 1930s as an ideological elite military force. SS- Verfügungstruppe (Special Disposal Troop, or SS-VT) units took part in the invasion of Poland in September 1939, and in the following month the decision was made to quickly expand the force into what became known as the Waffen-SS. By the spring of 1940, the SS-VT division was organized into three regiments – “Deutschland”, “Germania” and “Der Führer”. These units were at the forefront of the attack on the West in May 1940. After the successful conclusion of the campaign, the SS-VT division was soon renamed the SS-Reich Division (Motorized). This particular division is the subject of Concord Publication’s latest book, which is entitled “Into the Cauldron – Das Reich in France 1940”. It is written by Robert Michulec, an author well known to Concord readers. Following the usual format of other books in the Warrior 6500 series, this volume contains 52 pages, with a four-page colour section in the centre. This central segment features four colour plates by talented illustrator Dmitriy Zgonnik. They show four “Das Reich” soldiers dressed in various types of uniform and equipped with a range of weaponry, while the accompanying text elaborates points of interest. 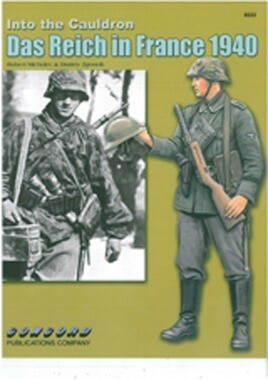 The heart of the book is the collection of black and white photographs showing “Das Reich” troops from the 1940 period. Coverage commences with training photos in early 1940, and the content then documents the campaign in France. Many photos contain excellent close-up details of uniforms, personal equipment and personal weapons. A great number are “in-action” photos, and they show auxiliary equipment such as motorcycles, wheeled vehicles, halftracks, armoured vehicles and antitank weapons too. For readers interested in the invasion of France, and particularly the involvement of the Waffen-SS, this volume offers concise yet comprehensive coverage. The sharply reproduced photos give a very real sense of this campaign by “Das Reich” in the early part of WWII, and the details they portray will be of great value to figure modellers and military enthusiasts alike.